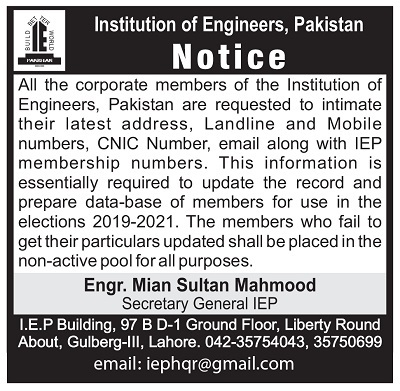 The Institution of Engineers, Pakistan (IEP) Rawalpindi-Islamabad Centre was established in 1973 at Rawalpindi. The centre was shifted to Islamabad in 1983. 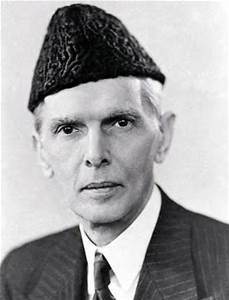 "If Pakistan is to take its proper place among the progressive nations of the world, it will have to take up a good deal of leeway in the realm of scientific and technical education which is so necessary for the proper development of the country and the utilization of its resources. The establishment of institution like INSTITUTE OF ENGINEERS will greatly stimulate technical research and help in disseminating available information. THE INSTITUTE OF ENGINEERS will not only benefit the engineers themselves by improving their technical knowledge but also bring lasting benefits to public services which they are called upon to perform. "I wish the Institute every success." (Quaid-e-Azam's message to the first Inaugural Meeting of the Institute of Engineers on June 20, 1948). 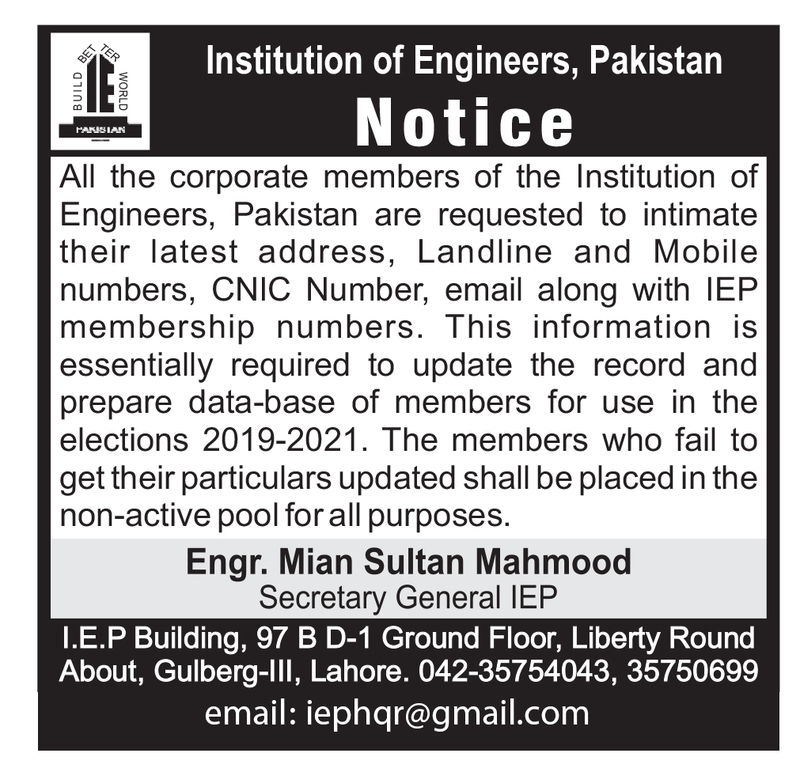 I am pleased to say that the elections of the Institution of Engineers Pakistan (IEP) have been held and team for the term 2016-2018 has assumed the office from January 2016. As a result of the elections conducted in December 2015, I am honored to have been elected as the President IEP. I thank you all for your valuable support and seek your cooperation. IEP is the leading professional body founded by Qaid-e-Azam Muhammad Ali Jinnah for promoting engineering, technology and allied sciences. It has been in the forefront for improving technical competency, developing skills and enrichment of careers of its members, besides enhancing their social well-being. Sharing knowledge, experiences and ideas has been the hallmark of the Institution. Effective dissemination of engineering and professional services is being done, in accordance with primary aims and objectives of the Institution. Transforming the Institution into a vibrant and effective body will be my first priority. Short-term and medium-term programs are being chalked out at all the Centers of the IEP aiming to achieve its goals. Interest of the members in the affairs of the Institution will be renewed. 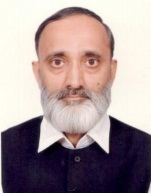 Voters list will be updated for which work has been initiated. Regular interaction and cost-effective communication with all members will be established. An effective drive for membership will be launched. Conducting a series of lectures, seminars, conferences, symposia and workshops on national issues are regular features of the Institution. Exchange of knowledge and ideas will be fostered to develop further a clear road map of professional thinking and practices. 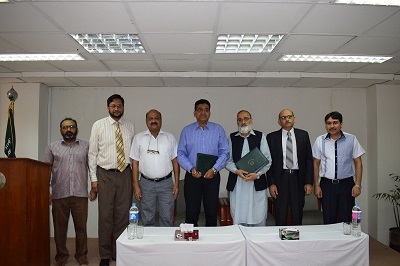 Diversified and quality CPD (Continuing Professional Development) Courses, which is a collaborative activity of ours with the Pakistan Engineering Council, will be conducted regularly. 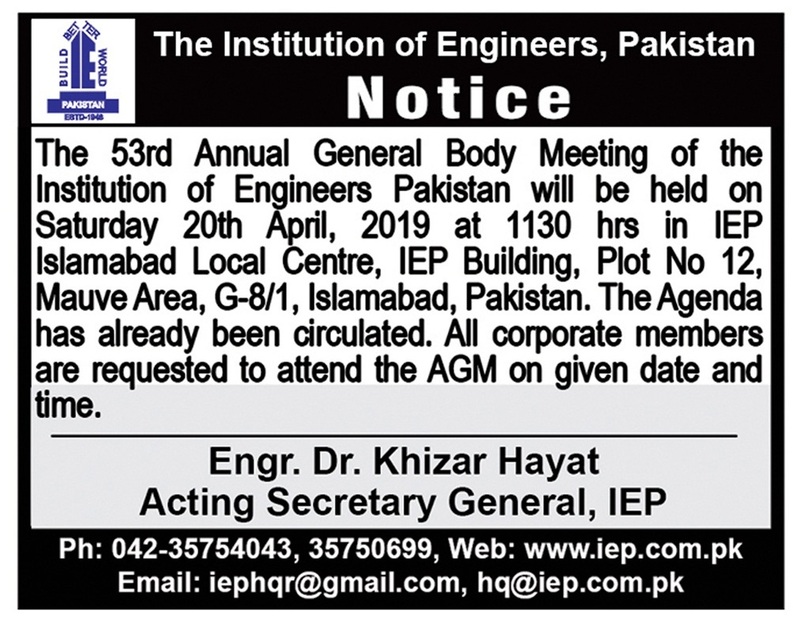 On behalf of The Institution of Engineers, Pakistan, Local Council Rawalpindi – Islamabad (IEP-RIC) Chapter, we welcome you to the IEP-RIC. The current council has been elected for term 2016-2018. Our major focus during the period will be revitalizing the role of IEP to develop, integrates and mobilize the Engineers of the region for socio-economic development of the country. Besides capacity building of the members, we will endeavor to further enhance the image of the Institution, work collaborating with other Chapters and Central Council, academic and industry for the development and welfare of Engineering Community. The Institution of Engineers, Pakistan belongs to all Engineers of the country and Young Engineers are its integral part. We will also try to involve our young breed of Engineers in the Workshops, Seminars, Conferences and other capacity building initiatives. Students’ and Young Engineers will be actively involved in various initiatives of the IEP. In addition to mobilizing various committees, “The think tank” role of IEP in national and international issues will be strengthened and effective Engineering input will be provided to Governments and Society for a happier and prosperous country. Please feel free to visit IEP-RIC as your home and share your candid opinions, suggestions and comments with us to achieve the vision of ”Excellence in Engineering Profession”.